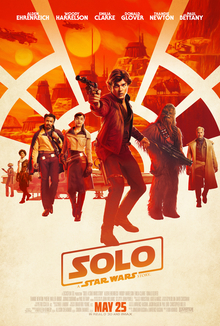 Solo: A Star Wars Story has a very unique distinction among the Star Wars movies. It’s the only movie in the franchise to be considered a box office bomb. Generally speaking, a movie must gross somewhere around twice its budget to make a profit, yet Solo earned $392 on a budget between $275 and $300 million. Even The Empire Strikes Back, which was the lowest grossing movie of the original trilogy, earned $450 million back in 1980 (on an $18 million budget as well). Adjusted for inflation, Empire is the second highest grossing sequel of all-time. I originally planned to write this post back when the movie released in May, but after seeing it for the first time, I couldn’t bring myself to care enough. By no means did I dislike it, but I thought it was just ok. In the 7 months since my thoughts have changed, but we’ll get to that. Ideas for this movie began as early as 2012, with George Lucas developing a story about a young Han Solo. He hired veteran Star Wars writer, Lawrence Kasdan (Empire Strikes Back, The Force Awakens) to write the screenplay. After Lucas sold Star Wars to Disney, they hired him to finish the script for Force Awakens, leaving Lawrence’s son, Jonathan, to be the lead Solo writer. Eventually, the father and son duo wrote Solo together, making this what Lawrence intends to be his last Star Wars writing job. Ron Howard (Apollo 13, The Da Vinci Code) ended up directing the movie. That’s one very good movie, and one very forgettable movie. Of course, Howard wasn’t the original director, but we’ll get to that soon. The casting and production turned out to be a lot messier than hiring the writers and directors. They ended up auditioning more than 3,000 potential actors to portray a young Han Solo, including the likes of Scott Eastwood, Taron Egerton and Logan Lerman, until they landed on Alden Ehrenreich. It turns out that Ehrenreich’s father was Steven Spielberg’s personal accountant for years, giving him an indirect connection to the Star Wars franchise beforehand. Also in the cast is Woody Harrelson as Beckett, a mentor figure for Han, Emilia Clarke as Qi’ra, Han’s former lover and a survivor, and Donald Glover as Lando Calrissian. Michael K Williams was originally cast to play the villain, but he was removed from the film after he couldn’t return for the delayed reshoots, so Paul Bettany took over. Filming began in January of 2017, originally to be directed by Phil Lord and Christopher Miller. By February 10, the film had already spent $54 million on production. In June, Lucasfilm announced that the original directors left the film over creative differences. It was later reported that Lucasfilm fired them after disagreeing with the writers over the shooting style. The directors believed they were hired onto a comedy, while in truth they were hired to add a comedic touch for a movie that was otherwise supposed to be serious. Apparently the directors also encouraged too much improvisation, which shifted the story off-course. They also used camera angles that were too low preference, making a lot of their footage unusable. The late switch in directors led to a much larger reshoot than what’s typical, leading to a lot of rumors of trouble. Clearly they weren’t unfounded. On the first day of Howard’s stint as the film’s director, George Lucas visited the set. Although Lucas didn’t intend to interfere, at one point he asked “why doesn’t Han just do this?” in relation to a scene on the Millennium Falcon, a suggestion that apparently made it into the final film. Hint – it’s a subtle moment when a character is trying on one of Lando’s capes. It was confirmed in March of 2018 that Howard needed to reshoot around 70% of the film. The original directors decided not to challenge for director credits, and instead settled for executive producer credits. The post production wrapped up in late April, mere weeks before the film’s wide release. That’s not as tight as it was for Return of the King, which was literally blow-dried to get it ready for the premier, none of the editors having seen the final cut in full, but that’s still cutting it pretty close. The film was originally expected to earn between $285 and $340 million worldwide on its opening weekend, but only earned $147 million worldwide. It earned a 70% rating on Rotten Tomatoes, with an average score of 6.4/10, making the reviews mixed but generally positive. The general consensus is that it’s a flawed but fun movie, and as long as you check your expectations, you could have a good time. The Rolling Stone gave it 2.5/10, praising the cast, but playing its story way too safe for a character about a rogue. The New York Times noted that the movie doesn’t take itself too seriously, but it’s “a curiously low-stakes blockbuster, in effect a filmed Wikipedia page”. The movie’s bombing has led to rumors that Lucasfilm is planning to slow down with Star Wars movies. Personally I hope they do, because Star Wars is a bit too special to release a movie every year, not to mention it’ll be very hard to keep the quality up for that production rate. I’d personally be fine with a three year cycle, with one major release one year, a smaller movie the next, and then a year off. As for my own thoughts on the movie, I liked it better the second time round. Maybe it’s partly because I knew what to expect. Ehrenreich was given the impossible task of portraying the rogue smuggler originally portrayed by Harrison Ford, and he does ok. He’s not as charismatic or as entertaining, but he’s fine. Glover is really good as Lando, bringing a sense of fun that the movie desperately needed. The story is straight forward, being a sort-of heist movie. There aren’t any big surprises in the story. You’ve got multiple betrayals at the end that you kind of see coming. Han Solo shoots first in a mildly amusing moment that resembles both the Tatooine Cantina controversy and that one scene from Indiana Jones and the Raiders of the Lost Ark. You see the moment Han meets Chewbacca, and while it’s not bad, it doesn’t feel as special as it should. The friendship between Han and Lando is so brief that it’s almost not worth showing. Really, the best part of the movie is the heist that turns into a prison riot, and the kind of exciting Kessel Run scene. Everything before that is, while well-constructed and choreographed, kind of forgettable. But perhaps the worst part of this movie is that it exists. I’m not saying that fans don’t want more Han Solo – he’s an awesome character. I’m saying that Han Solo is the kind of character who’s best left as a mystery. Characters like him, Boba Fett and Darth Maul are at their best when you don’t know about their past. Thankfully this movie doesn’t explore too much of Han’s early years – his childhood is only given one quick sentence of exposition. That, along with the production problems that got people worried, is probably the real reason why Solo bombed. Not because of the movie’s quality. I never asked for this movie, and unlike Episodes 7 and 8, and Rogue One, I was never all that excited about Solo: A Star Wars Story. Solo is by no means a bad Star Wars movie. The whole movie is watchable, and there are times when it’s quite enjoyable. Most of the cast does a good job with what they’re given, even if it’s not hard to feel that nobody could match Ford’s original Han Solo portrayal. Unfortunately the story and the character development plays it way too safe. Han doesn’t feel like he’s rogue enough – he already feels like how his character acts and sees the world in Return of the Jedi, after he’s already grown into a true hero through the trilogy. But I’d still sooner watch this over the first two prequels. It’s at least worth a watch if you’re a Star Wars fan; just don’t expect to be blown away. I think I’m going to save my list of favourite Star Wars movies for after Episode 9 releases. That of course means that my next movie post will probably be Pixar related, followed by a couple James Bond posts to wrap up that blogathon. Next year I plan to hopefully continue the DreamWorks blog posts that really stalled after the second month, as well as looking back at every single Marvel Cinematic Universe movie released to date. I also hope to look at all 14 of the Disney Animation Studios associated movies, which would include movies like Victory through Air Power, Pete’s Dragon (the 1977 version), James and the Giant Peach, Enchanted, The Nightmare Before Christmas, Who Framed Roger Rabbit, and of course both Mary Poppins movies (Returns releases next month). This entry was posted in movie review, movies and tagged alden ehrenreich, chewbacca, donald glover, emilia clarke, george lucas, han solo, harrison ford, kessel run, Lando Calrissian, lucasfilm, millenium falcon, movies, new york times, paul bettany, qi'ra, rolling stone, rotten tomatoes, solo: a star wars story, star wars, star wars movies, woody harrelson. Bookmark the permalink. I thought Solo A Star Wars Story was a much better movie than I was expecting. Sure, its wasn’t the strongest Star Wars film, but it was a fun enough story. I think it suffered from the backlash against The Last Jedi really. It’s hard to say exactly why it failed. The backlash likely didn’t help. All of the reports on production problems certainly would have contributed. But I did like the movie more the second time round. There’s nothing special about it, but it’s watchable, usually funny when it tries to be, and the actual heist scene is kind of awesome.